In the years 2011-2013 there will be carried out a series of experiments with the method in situ alkaline hydrolysis. 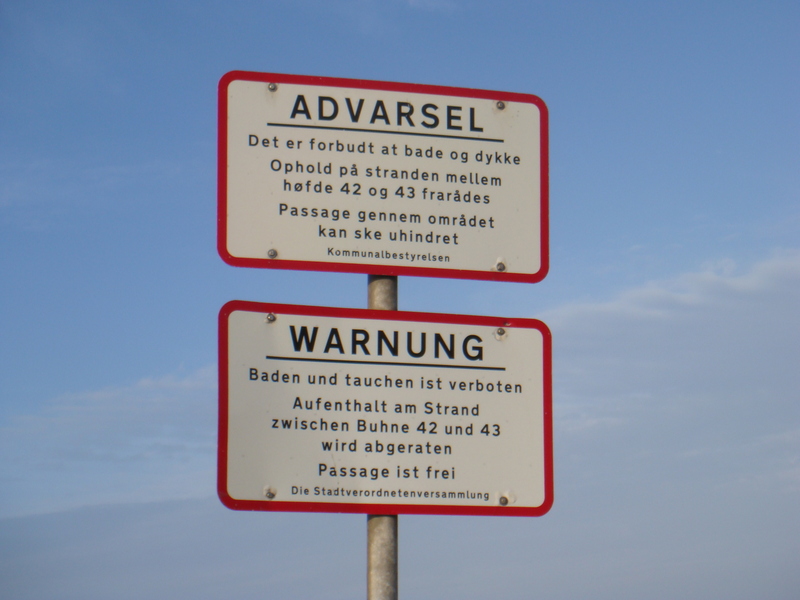 The project NorthPestClean is financed by the EU under the Life+ 2009 programme, bye the Danish EPA (EPA=Environmental Protection Agency) and the Region Midtjylland (Central Denmark Region). The aim of NorthPestClean is to document the efficiency of the method in situ alkaline hydrolysis with large scale experiments. The severe contaminations at groyne 42, makes it to an obvious site for the implementation of the experiments. The experiments will be carried out in a number of test cells. Each cell consists of a small contaminated area enclosed by a 14m deep steel sheet piling. 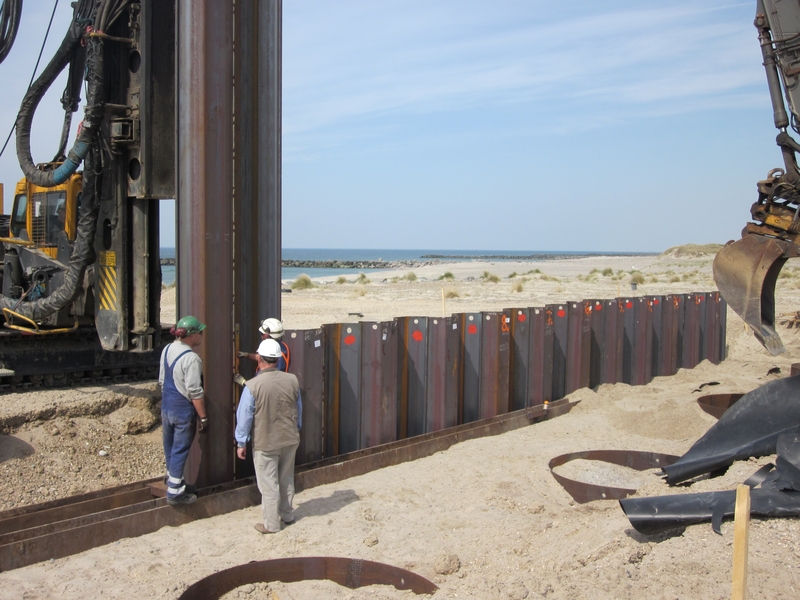 The bottom of the steel sheet piling is anchored in a thick layer of clay, whereby hydraulic control is achieved. The first step of the new remediation method consists of draining groundwater from the test cells. The test cells are then filled with dilute caustic soda, raising the pH to 12. Alkaline hydrolysis is allowed to take place in the subsurface for several months. During this period, the toxic substance parathion is degraded to two water-soluble and less toxic substances, which are subsequently removed from the soil by pumping groundwater to the surface. The treatment cycle is repeated 2-3 times. Additional technologies are also being tested at the site. The purpose of these additional technologies is to enhance the contact between the caustic soda and the contaminants, thereby accelerating the degradation process. It is well described in the scientific literature that alkaline hydrolysis can be used to degrade organophosphorous insecticides to less toxic and water-soluble metabolites. The method has been used for many years by agrochemical companies that kind of pesticides to neutralise the compounds upon accidental spills, but also as a pre-treatment of wastewater containing organophosphates before it is led to the biological wastewater treatment plant. A prerequisite for the methods efficacy in soil is contact between the reagent and the contaminants. This can be difficult to achieve in an environment, where the contaminant is bound to soil particles several meters below surface. Therefore it will be a central element in the experiments test methods to enhance the contact between the reagent and the contaminants. Groyne 42, the site for the experiments, is an example of a contaminated site that poses a risk for both human health and the environment at large. The site, which is named after a nearby groyne pointing into the North Sea, has in 1950’es and 1960’es been used as a chemical dump with the authorities accept.